For patients seeking a totally non-surgical option, Mesotherapy and Lipodissolve procedures are absolutely ideal. Quick and relatively painless microinjections of highly specified medications are applied directly under the skin, replacing the need for bulky cannulas or probes. The active compounds in Mesotherapy and Lipodissolve seemingly melt away embarrassing fat by stimulating the immune, circulatory, and lymphatic system to dissolve and then eliminate fat naturally. No need for any external suction devices with Mesotherapy and Lipodissolve – your body does all the work for you! And because Mesotherapy and Lipodissolve are non-surgical procedures, there is no downtime or disruption to your busy schedule. Many patients have the procedure done on their lunch breaks and return to work right away. For many women, one of the most exciting aspects of Mesotherapy is its ability to help fix cellulite. Even thin women suffer with the dimpled or “hail damaged” appearance caused by these embarrassing lumpy deposits of fat. Many experts agree that Mesotherapy is the treatment of choice for smoothing out the incredibly stubborn lumps and bumps. Lipodissolve is typically used where deeper injections of medication are necessary to reduce fat and contour the abdomen, flanks (love handles) and thighs. If substantial weight loss is the goal, an alternate weight reduction program, like the hCG Diet, is more appropriate first. Despite a healthy diet and regular exercise many people suffer from areas of fat and cellulite that are stubborn to remove, even on individuals who are relatively fit and toned. Lipodissolve and Mesotherapy involve multiple injections of active ingredients into areas of hard to remove body fat, seemingly melting it away and expelling it from the body. The Lipodissolve treatment utilizes a safe soy based compound that, when injected directly into the area of concern, breaks apart the fat molecule dissolving it into a liquid that is naturally eliminated from the body through the body’s lymphatic system. The soybean extract named phosphatidylcholine has the same molecular structure as the phosphatidylcholine found in the human body, and its main function is to break down fat and cholesterol. The extract has also been proven to assist in the increase of metabolism and liver function. Mesotherapy injections for fat loss also involve the injection of additional beneficial active ingredients in the solution, which may include various medications that break down the fat cells faster, prevent fat cells from storing more fat, and stimulate a more rapid release of the fat that is already stored. The new FDA-approved Kybella injections consists of one of these ingredients, deoxycholic acid. The prescription medications in Mesotherapy for fat loss are only available to physicians from FDA approved compounding pharmacies. They are administered only under Dr. Rodriguez’ supervision. Mesotherapy preparations administered by non-physicians may not contain these effective fat-dissolving medications with the phosptatidylcholine and deoxycholic acid, but may contain other nonprescription, unregulated substances or herbal extracts not manufactured in FDA approved facilities. Mesotherapy is also effective for problem areas of cellulite to correct the “hail damaged” appearance, even in relatively thin individuals. By adjusting the medications to your particular situation, Dr. Rodriguez can use the Mesotherapy to improve skin quality where laxity (looseness) or stretch marks have developed after childbirth or rapid weight loss. Mesotherapy can also thin and reshape fat deposits in areas such as ‘love handles,’ jowls, cheeks, neck, and chin without surgery. Lipodissolve is typically utilized where deeper injections are required for fat reduction to improve the contour of the abdomen and thighs, rather than purely for cellulite or related skin problems. Despite the differences, doctors often use the treatments together. They both stimulate the body’s lymphatic, immune and circulatory system to stimulate normal processes get rid of fat that is then broken down and eliminated. Mesotherapy/ Lipodissolve Procedure The treatment does not require a local or general anesthetic, but some patients may opt for the application of a topical anesthetic cream prior to the procedure. 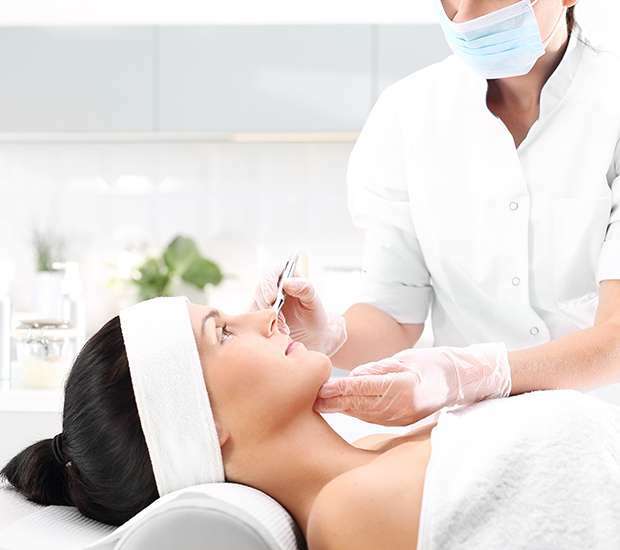 Both Mesotherapy and Lipodissolve involve using a tiny needle to make many injection points just underneath the surface of the skin in the areas of concern. A very small amount of the medication is then injected into each of the needlepoints with a typical Mesotherapy or Lipodissolve treatment taking around 20 to 30 minutes to perform. Injections are recommended every two to three weeks with an average of six to ten treatments required, depending on the amount of fat and, in the case of Mesotherapy, the degree of cellulite or skin laxity. Gradual results can be seen within a few days of each treatment, once any swelling dissipates. Mesotherapy will not only reduce visible fat, but can also lessen the dimply appearance of cellulite. Areas for Mesotherapy/ Lipodissolve Treatment The Mesotherapy and Lipodissolve treatments can be targeted for areas of hard and soft fat, including abdominal areas, love handles (flanks) upper and lower back areas, thighs, arms, knees, and the buttocks. Areas of cellulite on legs and thighs can be successfully treated with the Mesotherapy procedure, as well as excess fat on the neck and face. Most patients turn to Mesotherapy or Lipodissolve where targeted exercise and a healthy diet have failed to work to remove the stubborn areas of remaining cellulite or fat. Mesotherapy/ Lipodissolve Recovery The procedures are minimally invasive and therefore have the advantage of a limited recovery time, with the patient noticing only a slight burning or redness in the area immediately following treatment. This usually subsides within a short period of time and can be alleviated with the use of over the counter pain pills and ice packs applied to the area in the first 24 hours. There may also be swelling and tenderness in the area, which will disappear within a few days. Patients can return to normal activities and work immediately following the treatment. At Lipo Body Sculpture of Houston, photos and measurements are taken before the treatments and following the treatment recovery period. On review four months after their series of treatments, some clients can lose eight to ten centimeters in treated areas such as the abdomen, with a significant contraction of the tissues and little residual skin. As with the Smart Laser Liposuction, VASER Lipo, or Smartlipo, regular exercise and a healthy diet are important to more effectively attain and maintain your desired body contour goals. Mesotherapy/ Lipodissolve Risks Complications and side effects of Mesotherapy and Lipodissolve are minimal when compared with other cellulite reducing and fat sculpting treatments or non-laser liposuction. There may be a mild burning, itchy, or prickly sensation in the treatment area. As the fat is broken down, there may be localized warmth and redness, but this usually subsides by the next day. Bruising and swelling can also occur in the area, but most patients find that this is not excessive and does not last beyond the first week after treatment. When performed under a doctor’s supervision, both Mesotherapy and Lipodissolve have excellent records for minimal side effects and risks. A thorough consultation should take place prior to the treatment with Dr. Rodriguez, who will take into consideration factors such as medication you may already be taking, any previous allergy or skin problems, or any significant medical history. The treatments are not recommended for patients with major medical conditions such as HIV, hepatitis, heart disease or cancer. While Mesotherapy and Lipodissolve are not substitutes for a healthy diet and a regular exercise routine, they can aid in combating stubborn areas of hard and soft fat and unsightly cellulite. Many patients not suitable for invasive procedures such as liposuction or liposculpture are ideal for these non-invasive procedures for reducing these localized areas of fat. The treatments can also be used to treat areas of concern such as gynecomastia (male breast enlargement), unevenness that can occur after lipoplasty and liposuction, and lipomas, which are benign growths of fat in a thin fibrous capsule. Fit men and women are also taking advantage of the Lipodissolve and Mesotherapy for abdominal etching, to get a more defined ‘six-pack’ and reduce the ‘love handles.’ If substantial weight loss is the goal, an alternate weight reduction program, like the hCG Diet, is more appropriate first.